As part of a national research collaboration, Spanish researchers including the ICN2 have made uniformly nanoporous graphene a practicable reality. 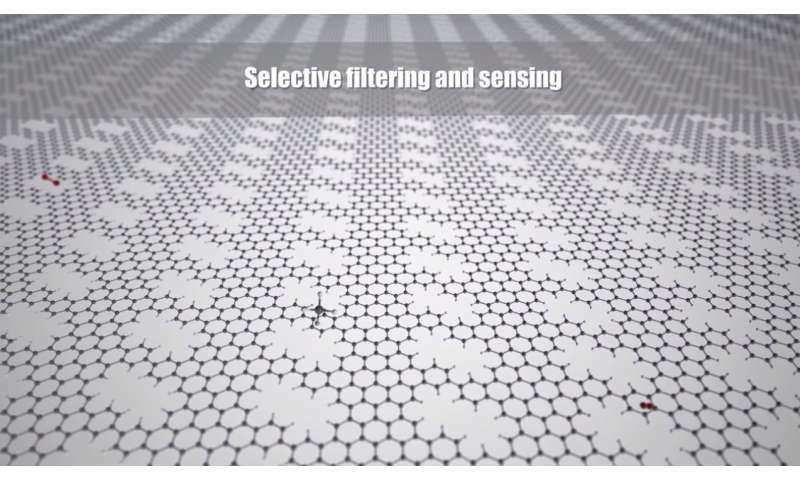 A major milestone in graphene research, this brings us one step closer to unlocking this material's full potential not only in electronics, but also in filtration and sensing applications. The work is published in Science. The researchers have successfully synthesised a graphene membrane with pores whose size, shape and density can be tuned with atomic precision at the nanoscale. Engineering pores at the nanoscale in graphene can change its fundamental properties. It becomes permeable or sieve-like, and this change alone, combined with graphene's intrinsic strength and nano-slimness, points to its future use as the most resilient, energy-efficient and selective filter for extremely small substances including greenhouse gases, salts and biomolecules. But a second, perhaps less intuitive change also takes place when the spacing between pores is similarly reduced to a few atoms. Doing so transforms the graphene from semimetal to semiconductor, opening the door for its use in electronic applications, where it could be used to replace the bulkier, more rigid silicon components used today. However, while all of this is true in theory, producing such a material requires a precision that current fabrication methods have yet to achieve, and look unlikely ever to do so. The problem is the approach—punching holes or otherwise manipulating a material that a single atom thick is an incredibly fiddly task. In the work described here, the team takes a "bottom up" approach based on the principles of molecular self-assembly and 2-D polymerisation, effectively growing the graphene from scratch with the nanopores already built-in. For this approach to work, the researcher required a very specific precursor molecule to use as initial building blocks that would behave as intended when subjected to different stimuli. In this work, these precursors were designed and produced by synthetic chemistry specialists at CiQUS, before being taken to the ICN2 for the "bottom-up" assembly of nanoporous graphene. They were submitted to several rounds of heating at high temperatures while placed on a gold surface, which serves to catalyse the reactions by which the molecules are first polymerised, to form long, lace-like nanoribbons, and then bonded laterally, to create the desired 2-D nanomesh structure complete with evenly spaced, evenly sized pores. Simulated at the DIPC and tested experimentally at the ICN2, the result is a new kind of graphene that exhibits electrical properties akin to those of silicon, and can also act as a highly selective molecular sieve. Applied in conjunction, these two properties are predicted to allow the development of combined filter and sensor devices, which will not only sort for specific molecules, but will alternatively block or monitor their passage though the nanopores using an electric field. Such electrical readings would provide additional information as to precisely what concentrations of which molecule are passing through the pores and when, something which also points to possible applications in more efficient DNA sequencing. Indeed, the real-world applications of such a tunable, uniformly nanoporous graphene membrane are manifold. They range from pollution monitoring and mitigation, to water desalinisation, and even applications in biomedicine, where such a slim, flexible, biocompatible membrane could be used to support failing organs like the kidney, one of the body's natural filters.